Did you know that 90 percent of adults don’t eat the recommended daily amount of fruits and vegetables? * Maybe if we saw MyPlate billboards as often as we see signs for fast food or soda, this number wouldn’t be so high. Since that’s not going to happen, it’s up to us to plant the MyPlate image into everyone’s minds. The MyPlate Start Simple poster is a great discussion-starter for helping people find simple ways to fill half of their plate with fruits and veggies, whether they’re eating at home, at a restaurant, at work, or at school. At home – this should be the easiest because you’re in charge. Keep lots of fruits and veggies on hand to fill up half of your plate. Bags of pre-washed baby spinach and spring mix make it easy to fix a salad every day. Stock your freezer with a variety of frozen vegetables to steam, microwave, or roast in the oven. At restaurants – you don’t have as much control, but checking out the menu online ahead of time can help. Look for vegetable sides and order an extra serving. If you’re getting subs or burritos, visually deconstruct them to see how they would look on a plate, then decide if you need to add an extra veggie or fruit, choose a salad instead of sandwich, or go easy on the rice. Packing lunch – keep that plate in mind as you put your lunch together. Pile all the veggies you can onto sandwiches. Add sides of raw veggies like baby carrots and cherry tomatoes, and a piece of fruit. Or pack lunch the easy way – leftovers from a MyPlate-friendly dinner make the perfect MyPlate lunch. *Source: CDC (read more here). Holiday times are here! This means a lot more activity and disruption to regular meal and exercise patterns. The good news is that you can remember MyPlate’s most important message to lower calories and eat healthier! Make half your plate fruits and veggies. #1. Fill appetizer plates halfway with vegetables. Visualize a plate before you eat snacks (and bring your snacks!). Are you zooming through the mall and tempted by large pretzels, cookies, and cinnamon rolls? They smell great and offer holiday spirit except they are really bad news for your waist. We have become oblivious to lare sizes because they are everywhere. Picture that item on a dinner plate. Does a cinnamon roll or pretzel likely take up a whole plate? That is too much! Bring an apple in your bag or choose a healthier item from the food court. #2. Fill dessert plates halfway with fruit. Instead of filling up your plate with pie, cake, brownies, and cookies, fill it up with fruit and leave room for a small slice or piece of one favorite treat. Hint: bring a beautiful fresh fruit salad or bowl of fruit so you can have this option. #3. Make a healthy plate for lunch and dinner. No matter where you eat, using the MyPlate method of portion control can help you lower calories. 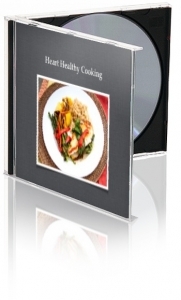 Make MyPlate at home, when you eat out, and when you are a guest somewhere else. It works in the cafeteria, the food court, the drive through and office parties! #4. Eat a healthy snack plate with fruits and veggies before going to a party. Okay so we realize it is not always easy to eat MyPlate at someone else’s house or the office party. So here is one more strategy. 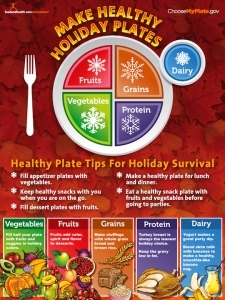 Eat your MyPlate fruits and veggies before you go out. Eat a small salad and a piece of fruit — that way when you go somewhere you can have a smaller serving of what they are offering and you won’t arrive starved only to fill up on a whole plate of fried chicken or fatty roast beef and fritters. A typical plate filled with fried chicken and macaroni and cheese weighs in at over 850 calories! That’s way too huge for a single meal. Plus, the plate is full of solid fats and processed grains, with very few nutrients in sight. This is where MyPlate comes in handy. 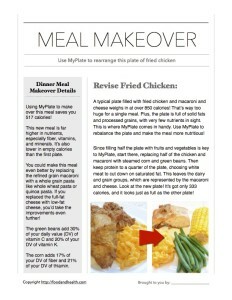 Use MyPlate to rebalance the plate and make the meal more nutritious! 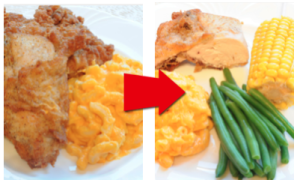 Since filling half the plate with fruits and vegetables is key to MyPlate, start there, replacing half of the chicken and macaroni with steamed corn and green beans. Then keep protein to a quarter of the plate, choosing white meat to cut down on saturated fat. This leaves the dairy and grain groups, which are represented by the macaroni and cheese. Look at the new plate! It’s got only 333 calories, and it looks just as full as the other plate! Using MyPlate to make over this meal saves you 517 calories! This new meal is far higher in nutrients, especially fiber, vitamins, and minerals. It’s also lower in empty calories than the first plate. You could make this meal even better by replacing the refined grain macaroni with a whole grain pasta like whole wheat pasta or quinoa pasta. If you replaced the full-fat cheese with low-fat cheese, you’d take the improvements even further! The green beans add 30% of your daily value (DV) of vitamin C and 20% of your DV of vitamin K.
The corn adds 17% of your DV of fiber and 21% of your DV of thiamin. And don’t miss these other engaging MyPlate materials from the Nutrition Education Store! Make Your Salad a Rainbow! Did you know that four final rules for implementing the Healthy, Hunger-Free Kids Act (HHFKA) were just announced? In a nutshell, the USDA finalized its rules for nutrition standards for all foods sold in schools, including breakfast, lunch, and snacks. 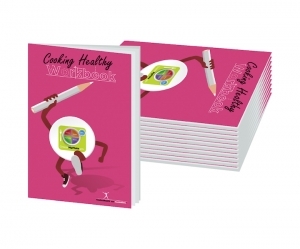 Want to help communicate the key nutrition lessons that are central to these new rules? Check out this fantastic new salad bar sign! After all, making healthful food available is only half the battle. We need to make it appealing to kids too. This new salad bar sign is a better design and at a lower price than the previous version, and the video above offers some great inspiration on how to use it. That seems to capture a common sentiment in a nutshell. How do people plan menus and think about turning what’s available into a healthful meal? Is this something that’s intuitive or can it be learned? For me it’s easy, because I love to cook and experiment with food. But what about people who really don’t like to prepare meals or don’t have these skills? All home management experts say that planning meals ahead of time is the number one way to save time, have balanced meals, control the food budget, avoid food waste, and reduce trips to the grocery store. However, I’m realistic enough to know that most families don’t do this. So, how can we, as health educators, make this easier for our clients? 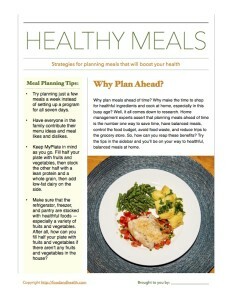 Try planning just a few meals a week instead of setting up a program for all seven days. If this works, then perhaps you could develop a menu rotation. Have everyone in the family contribute their menu ideas and meal likes and dislikes. 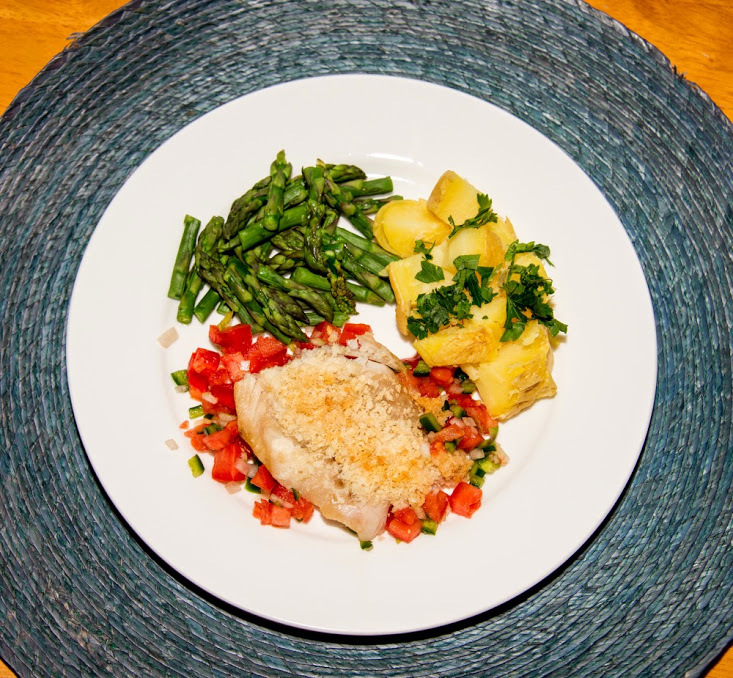 If other members of your family are just learning to cook, or don’t yet have a wide recipe repertoire, having menus posted can help them learn and develop their cooking and menu-planning skills. 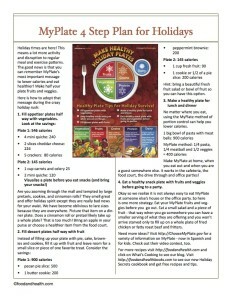 Keep MyPlate in mind as you go. We all know the concept of trying to fill half the plate with fruits and vegetables at each meal, so now it’s time to put it into action. Remember to fill the other half with a lean protein and a whole grain, then add low-fat dairy on the side to round out the meal. Post your planned menus. That way, everyone in the family knows what’s for dinner. This could help the first one home to get dinner started too! 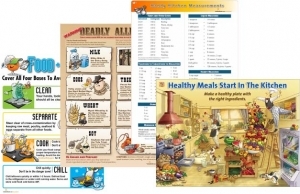 Make sure that the refrigerator, freezer, and pantry are stocked with the foods that you need for these menus. It’s especially important to have a variety of fruits and vegetables available for meals and snacks. After all, how can you fill half your plate with fruits and vegetables if there aren’t any fruits and vegetables in the house? Try these tips and who knows? Maybe the next time your family looks into the fridge, they’ll see dinner! 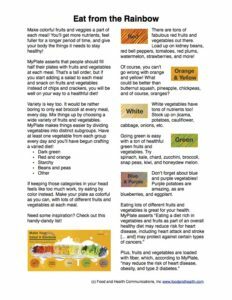 Here are some more healthy meal resources, brought to you by the Nutrition Education Store!